Destiny 2, a video game in which players travel through space, accidentally dismantling legendary mods and wasting hours of progress, just got a brand new raid called the Leviathan. And it’s one of the coolest things Bungie has done so far. For three years, the most exciting thing about Destiny 1 has been its mystery. From hidden exotic quests to obscure puzzles, Destiny 1's secrets were buried so deeply that even today we don’t know whether there was a sixth chest in the Vault of Glass. (Spoilers: There wasn’t.) Bungie continued that tradition in Destiny 2, packing the raid with an entire labyrinth full of secrets. As of right now, we still don’t know if people have found them all. When you first enter The Leviathan, the raid’s gimmick becomes clear. 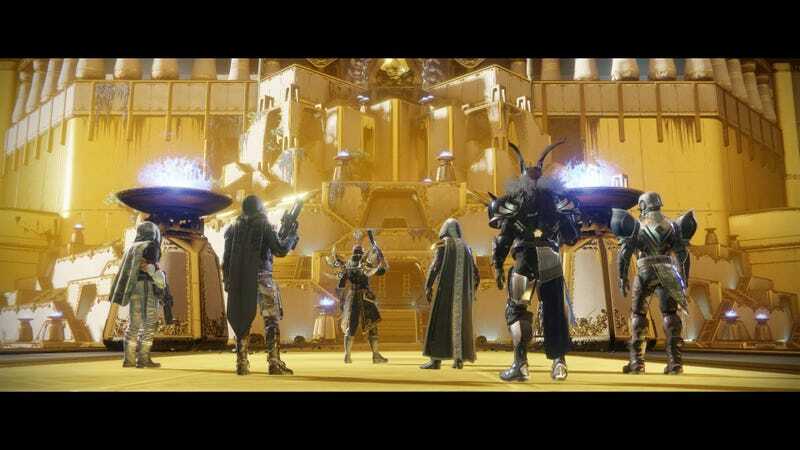 Calus, emperor of the Cabal, would like to thank you for killing the rogue commander Ghaul by inviting you to his palace, where you can participate in a series of tough trials involving relay races, stealth, and other traditional raid mechanics. You can play through the challenges on a standard run and have a great time. But if you, say, find a few hidden panels in the palace’s Bathhouse, then get someone to pull the lever while everyone’s standing in exactly the right place, you’ll open up a door to the Leviathan’s underbelly. And that’s where the real fun begins. There are a lot of different paths in the underbelly, and many of them lead to the exterior of the Leviathan’s massive palace, so if you get lost, you can always circle back to the main entrance. Some paths will even serve as shortcuts, allowing you to skip over the “flag-bearer” encounter that you’d normally have to finish between each of Calus’s challenges. Based on my own exploration and the accounts of intrepid raiders across the web, I think the Leviathan’s underbelly is nearly as big as The Taken King’s Dreadnaught. One intrepid Redditor drew some maps that might help you navigate the labyrinth, if you choose to go exploring. But nobody knows just how many secrets are waiting down there. Destiny 2 raid secret hunters are already doing their best to find all of the raid’s hidden treasures, and we don’t know what else could be waiting there. Chances are high that people will discover something incredible soon.